I know I’ve bene a total slacker. The holidays are rough and I’m having a ton of trouble with the updates made to WordPress. Everything gets really bogged down when I try to write a blog entry and it’s like my browser just wants to break. I’ve talked with a few other bloggers who’ve noticed this. I don’t like it because blogging is supposed to be fun and not something that makes you want to scream because things don’t work right. Grr. Honestly, I find it easier to blog from my phone without a real keyboard and there’s something wrong about that. I digress. I’m going to try to get back up to date with some of the posts that I’ve got planned. I think I’m looking at about 20 posts in my list, and that’s a lot! Here’s hoping I can catch up an keep you guys entertained. I used to do video unboxing on HangWith, which is a lot of fun, but I haven’t done that in the latter half of the year. Is this something you’d like to see embedded? Just asking. Hit up my comments and let me know. Isn’t that awesome? 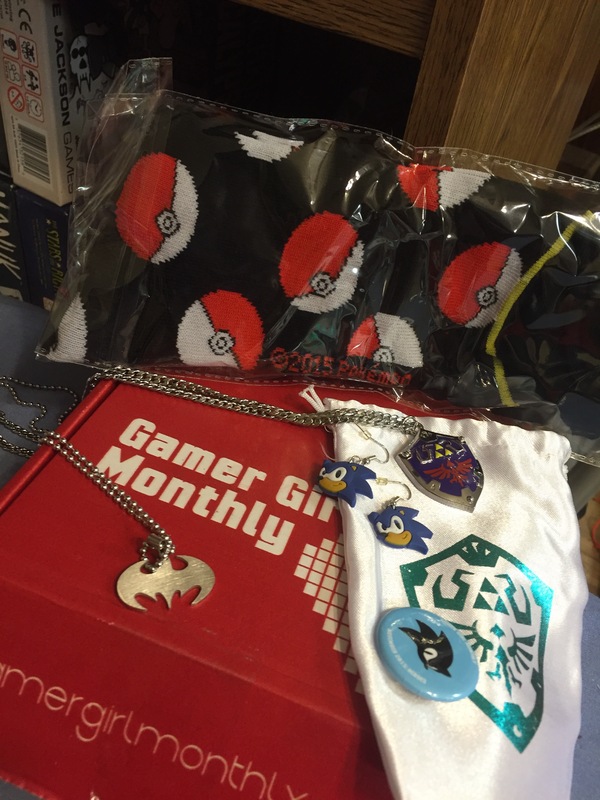 It’s all about the Zelda and Sonic…. Necklace 1: Silver Bat symbol: Need I really say more? I mean really. Now if I could find my Batgirl earrings and bat-knife, I’d be ready for anything. Earrings: I can’t imagine a time when Sonic the Hedgehog wouldn’t be fun to wear as earrings. Pokeball socks. Gotta catch them all and my Pokemon socks are ready. Keeping the grubby mitts of teen boys off these socks is a whole other problem. Who ever thought their clothing would get stolen by their sons? Talk about geek mom problems. Hyrule Bag of Holding for all the loot. I’m now planning what to repurpose this to, because oh yeah, a satin Zelda themed bag is totally a thing. Mini-flair: matches the earrings and I’m loving this in my collection. Remember October’s broken necklace? Customer service rocked it! After a few exchanges with a lovely lady at GGM, I had the promise of a new item shipped to replace in this month’s box. 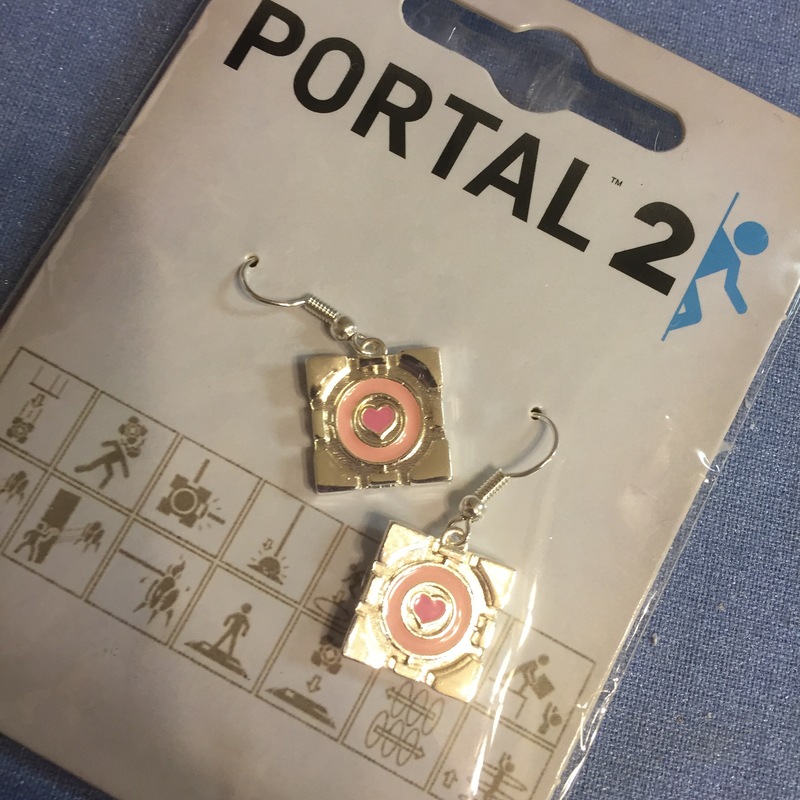 Portal 2 Companion Cube earrings.